Does a Bear Love the Woods? Of course he does! What bear doesn’t love the woods! This cutie pie from the Thankful Forest Friends has taken up residence on my desk for the last month. With that sweet smile, you know he just wants to be friends and maybe share that snack you’re having right now. Yes, the Thankful Forest Friends stamp set is listed as a Thanksgiving/Fall set but I couldn’t resist using him for a Christmas card. I knew he’d fit in perfect with those trees from the Wonderland stamp set. Okay, at first glance, he’s almost as tall as the trees. How do you fix scale in a situation like this? The easiest solution is to separate the two. By adding layers in between the bear and the trees, the trees look like they are farther off in the distance. It’s not a mistake. It’s an opportunity to be creative! Fixing stamping issues. So one tree image wasn’t enough to cover the front of my card so I stamped a second next to it. And since I decided to eyeball it, of course I didn’t line it up exact. ARGH!!! So… do I start over? Or try to fix it? I decided to fix it by just connecting the two lines with a marker. You can’t even tell that it wasn’t supposed to be like that. 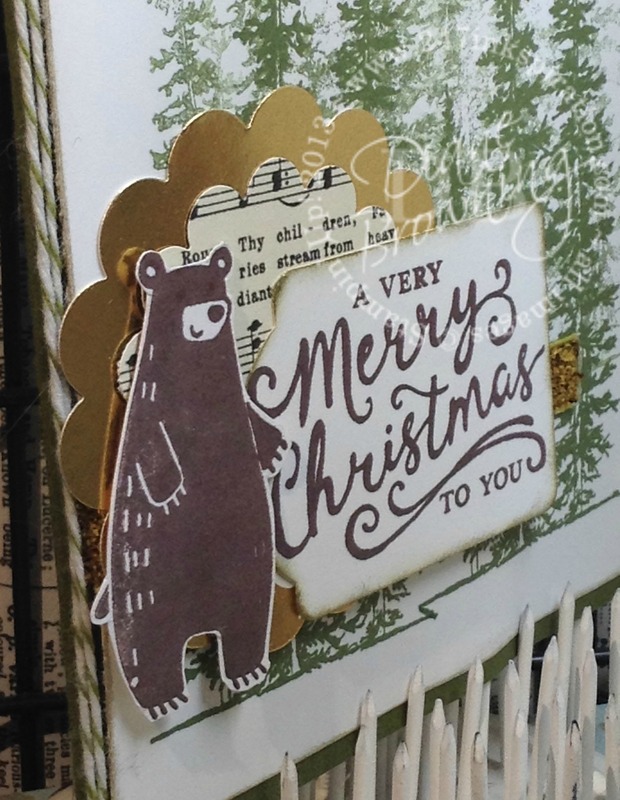 I could have moved my bear and all the layers lower, but I thought the bottom of the card would be far too crowded. 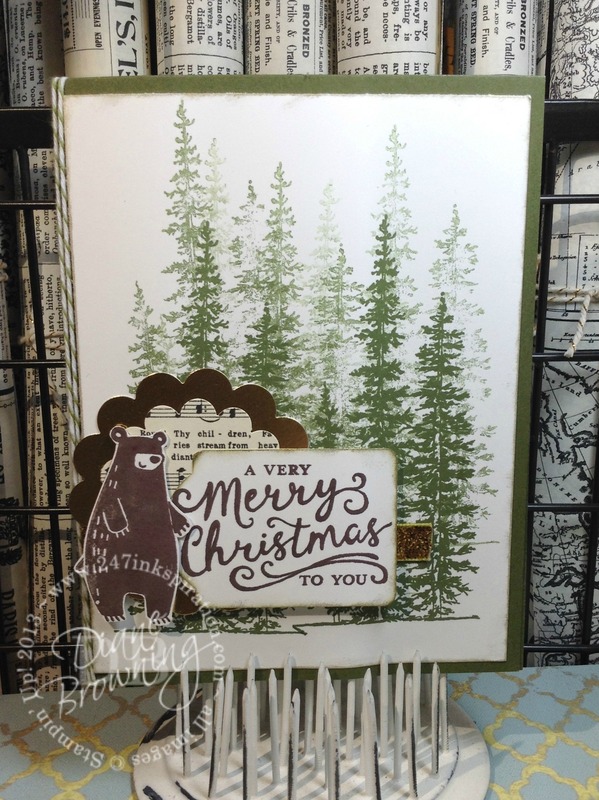 Do you see the gold glitter ribbon peeking out behind the “A Very Merry Christmas To You” tag? It’s sold in a two pack, one roll is white and the other is gold. I have a love/hate relationship with this ribbon. Plus: the glitter is super sparkly. Minus: there is so much glitter on the ribbon that it is really tough to tie it into a bow. For this card, I went with the “less is more” theory so you just see hints of the gold in the ribbon, the tag, around the trees, and of course the gold foil scallop circle too. Did you know that I make custom cards to order? This card is actually one of 35 for a very special customer who will be sending these out as her Christmas cards this year. 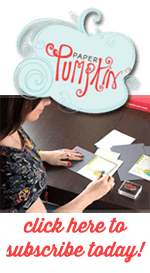 Do you need some special cards to have on hand? Do you need something for a special occasion? Contact me for further details or to place an order.